VISIR source code and papers acknowledged in a MSc thesis in Aerospace Engineering at the Technische Universiteit Delft (Netherlands). 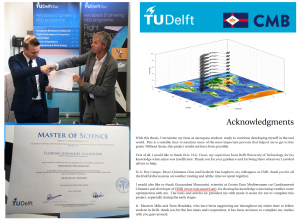 Florian Aendekerk successfully defended his thesis on “Weather Route Optimization for Oceanic Vessels” last May, 28th. Florian’s work has been carried out in cooperation with Compagnie Maritime Belge (CMB) and supported the conclusion that vessel fuel savings can be achieved through route optimisation based on forecast weather and ocean state.